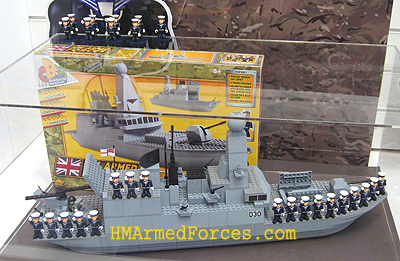 Unveiled at the London Toy Fair, HM Armed Forces Micro Figures and Playsets are a major new extension to the HMAF toy range. HMAF Character Building Micro-Figures and Playsets are marketed by Character under a new ‘Character Building’ line of ‘Collectable, Constructable & Compatible’ lego-inspired toys. The HMAF micro figures stand roughly 2″ tall and come with a display base; single figures are blind-packed and retail around £1.99 each. 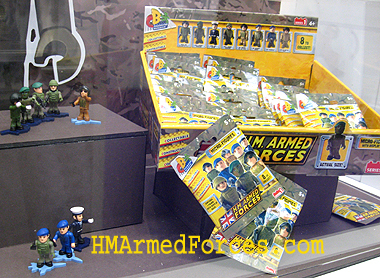 Each HMAF micro figure is assembles from around five or six components and comes with an accessory weapon or tool. Parts of the figures are completely interchangeable and are even compatible with another well known brand of minifigures and building bricks. 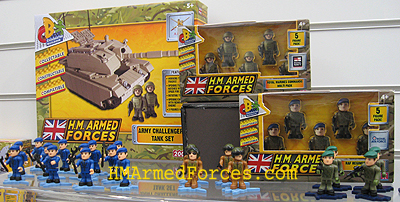 Series 1 figures are deployed in Spring 2011; Series 2 HMAF Micro-Figures will see action in Autumn 2011. Series 2 will see more releases from all three services including a Royal Navy Diver, Royal Marine and six others. All of the HMAF Character Building sets come with many accessories and extras. Verdict: Without exaggeration, it’s not possible to overstate just how brilliant this new HMAF toy line is. The look and feel is amazing with more detailed texture and sculpting than has traditionally been seen on other construction toy ranges. For playability, look and ‘must-have-ability’ 10/10.